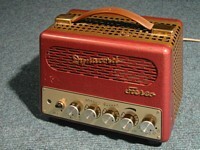 Another very, very rare tube amp from Dynacord. 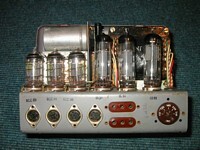 Very nice design with one EL84 in SE mode per channel and 3 ECC83 input and driver tubes. 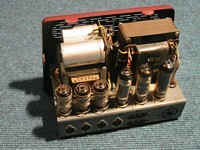 Tube rectification with EZ81. 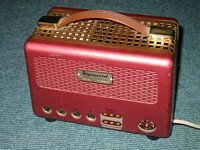 The HiFi / stereo amps made by Dynacord are ultra rare and I have only seen the “ST6” tube amp twice in over 15 years. The optical appeareance of this amps reminds on those Dynacord MV15 and Telewatt V120 or V117 mono tube amps (both EL84 push-pull). 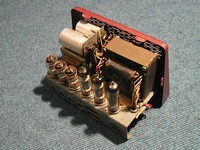 After having found some of the strange 270° DIN connector the amp sounds very nice in original condition and delivers a power ouput of 4 watts (into 16 Ohms only). 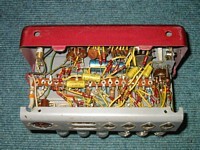 To obtain a linear frequency response the treble pot must be set to 3 o' clock and the bass pot to 5 o' clock position. One of my favourite units.